Whirlwind Hits Lake Sammamish over Memorial Day Weekend Lifting Rafts into the Air. Why so Strong? On Monday afternoon around 5 PM PDT, a whirlwind, also known as a dust devil, struck the shore of Washington's Lake Sammamish, overturning tables and lifting some rafts well into the air. To navigate, here is an areal map of the region, with a close in view using imagery below that. The red marker shows the incident site. Note that the whirlwind made landfall over the very northern part of the lake...that may be important. As shown on the video, the whirlwind was over water during the initial portion and then moved inland, where is looked like a fairly classic dust devil. But why did this vortex show up there and on this day? 4. Light winds in the region, since strong winds tend to interrupt or distort thermal formation. The location and time in question had a lot going for it, if you like a dust devil. There was an extended flat, uniform area (in Marymoor Park) just to the northwest of the landfall site.... I suspect that is where the whirlwind was generated. Here is shot from the northern portion of the flat area. Dust devil territory for sure. The day started out nearly clear and became partly cloudy as the air became less stable--so there was sun to warm the surface. And there was a large change in temperature with height (known as a large lapse rate). Here is a time-height cross section at Seattle Tacoma Airport, showing temperatures (red lines) and winds with height for the 24 h period ending 11 PM Monday. Between temperatures cooling aloft, while they warmed at the surface, a large decrease of temperature with height was apparent. Looking at the observations at Marymoor Park, temperatures hit the maximum (around 70F), just before the whirlwind formed. So all the ingredients for a dust-devil were in place, with the area downwind of the flat southern portion of Marymoor Park being a favorable location, a large change in temperature with height, light winds in the region, and enough sun to warm the surface. This whirlwind was scary for both man and beast, terrifying some poor dogs on the dock. And the raft that was lofted high in the sky? After traveling hundreds of feet and about 50 ft into the air, it came down on a lot several houses down the street. I bet that mystified the home owner. Why One Should Never Use the Term "Climate Denier"
Some terms are simultaneously hurtful, destructive, counter-productive and misleading. Climate denier is a good example of such an inappropriate phrase, and one that is unfortunately in vogue among some climate activists and media outlets. (1) It plays off the term "Holocaust denier". For most of the second half of the 20th century, the term holocaust denier was given to those who denied the reality of the holocaust--- bottom feeders such as neo-Nazis and those with strong anti-Semitic tendencies. The Holocaust is an historical fact in which 1/3 of the Jewish people were killed: an obscenity and a crime against humanity. It occurred. But some "environmentalists" have decided to use adopt this term for folks that have a different view of climate change than they have, included those that agree that climate is changing and that mankind is making some contribution to it. Furthermore, while the Holocaust is history and a known fact, climate change, and particularly anthropogenically forced climate change is another story: there are still major uncertainties regarding climate change, including the magnitude of the human-forced warming and the local impacts. Our models are very clear than increasing greenhouse gases will warm the planet, how much and spatially varying impacts have a lot of uncertainty. In short, using the term "climate denier cheapens the term "denier" in a way that is painful to many in the Jewish community. 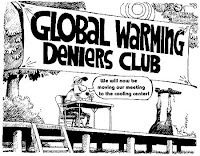 (2) The terms "climate denier" or "climate change denier" is usually used for anyone who does not "believe" that virtually all of the change in Earth's climate over the past half-century was caused by human emission of greenhouse gases. 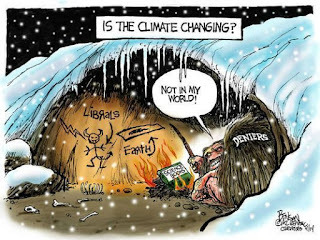 You are a climate change denier even if you accept that there has been climate change caused by natural processes, or if you believe that both natural variability and human forcing is behind the changes. Seems strange to call someone a climate change denier if they accept that there is climate change and mankind is contributing. Many climate activists demand that folks agree with them that virtually all climate change is caused by humans--or they use the "D" word. So many of my department, one of the leading research centers in atmospheric sciences of the country, should be considered climate change deniers. Go figure. (3) Climate denier clearly is a pejorative, put-down term that does not win converts or friends. Folks are irritated when they called a denier and a less likely to listen to the findings of climate science. We need to build bridges to those who are doubtful about the impacts of increasing greenhouse gases, and calling them names can only push them away. A number of leading climate communicators understand the dangers of the "D" word. Two weeks ago, Dr. Katherine Hayhoe of Texas Tech University, one of the current rock stars of the climate communication universe, spend a few days at my department. She explained why the denier terminology is bad and says she doesn't use it. Her favorite: climate dismissal. To secure real action on human-forced climate change one needs to build a consensus of folks with varied political backgrounds. Calling names is not the way to do it. Some of the most active name callers (folks who love the "D" word) ironically are some of the least informed and the most dramatic stretchers of the truth. Bill Nye, for example, loves to call folks deniers, while he makes exaggerated claims about the impacts of anthropogenic greenhouse gas forcing on extreme events (like major cold waves being caused by global warming). He frequently makes serious technical errors (he is not a climate scientist by the way). Why does such a poorly informed individual represent science? Al Gore also likes to sling around the "D" word and is constantly exaggerating the effects of greenhouse gases on extreme weather (yes, he also claims cold waves are caused by increasing CO2). Ironically, many of these name slingers don't seem concerned about their carbon intensive life styles, for example, jetting around the nation and the world, and owning big houses (or several houses in the case of Al Gore). There is another letter for such behavior and is starts with "H" and it rhymes with "theocracy." The ideas that the "deniers" are stopping progress on climate change is just nonsense. Some of the most knowledgeable, progressive people I know have the worst carbon footprints. Climate scientists are probably the worst of the bunch. Left-leaning politicians who enjoy traveling to unnecessary meetings (like a certain governor) are another. They know the truth, but they won't sacrifice in their own lives. See all the big cars being driven around Seattle these days?....those folks are not deniers. Most are good, card-carrying progressives. In fact, I have found a strong correlation between heavy use of the phrase climate denier and NOT knowing much about climate. There are a few exceptions to this (like Professor Michael Mann of Penn. State), but most folks fixated on going after climate denial have very weak backgrounds in climate and atmospheric sciences. 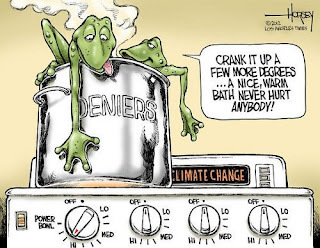 Instead of using fact-based arguments, such fervid "anti-denialists" often use a near-religious use of authority, pushing a baseless "97% agreement" among scientists about global warming. John Cook of Skeptical Science and Naomi Oreskes of Harvard are the worst offenders. 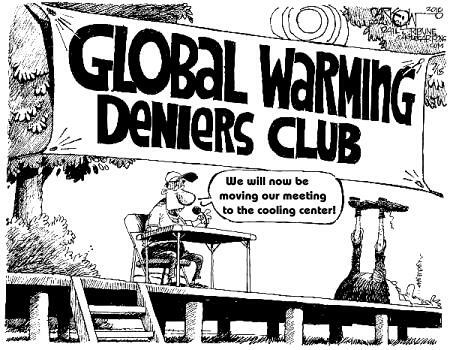 The media has used the "climate denial" narrative as a crutch. Instead of spending the time on learning about the highly technical details of climate science, it is far easier to cover (and participate in) the name calling. In many ways, this reflects the hollowing out of science coverage in U.S. media and the reduction in science journalism. The solutions to greenhouse gas emissions are not name calling or laying on guilt trips. The solutions will be technological, with new energy sources displacing fossil fuels. And eventually we will learn how to pull CO2 from the atmosphere on an industrial scale.. Putting down other people and calling names, might make some folks feel better, and perhaps represents "virtue signaling" in some quarters (such as with the staff at the Seattle Stranger tabloid), but it is counterproductive, without scientific basis, and hurtful. Time to drop the "D" word. Believe it or Not! May is the Wettest Month in Many Parts of the U.S. and the Driest in Others! To a Northwestener accustomed to November to January being the wettest time of the year, it may seem awfully strange, but for many locations May is the wettest month of the year. And for other locations May is the driest month of the year. Sure enough, there are wide swaths of the U.S. for which May is the wettest month: most importantly, northern Nevada into Wyoming and from Oklahoma to Ohio. In these locations, spring thunderstorms are more important than midwinter cyclones and fronts. Spring can be an unstable time of the year, with a strong sun warming the surface, while the atmosphere aloft is still relatively cool. The produces a large change of temperature with height (lapse rate).And there are still enough passing disturbances to help initiate the storms. In contrast, some locations have their driest month in May. Like southern Arizona. Why? Arizona gets some rain from winter weather disturbances and lots of rain from the summer "southwest" monsoon from late June to September. May is kind of a dead period for precipitation. Another dry May location includes Georgia and the panhandle of Florida. Take Tallahassee (see below). Tallahassee gets some winter rain from fronts and cyclones, but MUCH more in midsummer from convection (thunderstorms) due to the huge amount of moisture coming off the Gulf. Thus, spring and fall have less precipitation, with May barely edging out October. May is also a dry month in Alaska, with the winter storms ended. "Autumn" fronts and cyclones move in early there (starting in August). Thus, May is a very good time for an Alaskan cruise. And also fairly dry on the Big Island of Hawaii. Go to both if you can afford it. To put this all into context, here is the average precipitation for May for the lower 48 states. Some places get 6-8 inches (Arkansas, Tennessee) from thunderstorms, while parts of the southwest get less than a tenth of an inch. Think about how weird it would be to live in a place like the region northwest of Atlanta, right on the edge of a huge change in time of year of heaviest rainfall. Drive a hour or so one way (SE) , May is the driest month. Go the opposite direction (NW) a hundred miles or so, May is the wettest month. Think of the weather tourism possibilities. Here is a meteorological quiz. In May, where should you go for dry conditions with lots of sun? This year the correct choice would be (1) Western Washington State! It is increasingly possible that this extraordinarily dry May will tie the record for lowest May precipitation total ever observed at Seattle Tacoma Airport. The record low amount is .12 inches for the month. And that is exactly what we have right now. The expected rain for the last week of the month in Seattle. Zero. Here is the cumulative total precipitation predicted from 5 AM this morning through the end of the month. Western Washington gets a few sprinkles, while really heavy (and unusual) precipitation is found from northern CA, Nevada, southern/eastern Oregon, into Idaho, and Montana? Want a suntan? Western Washington is the place! Below is the difference from normal precipitation over the last 2 weeks for the western US. Western WA and NW Oregon are several inches below normal, but head east in to the desert areas and precipitation is well above normal. A more deceptive (but fun!) way to look at precipitation is the percentage of normal precipitation for the past two weeks. Parts of western Washington are enjoying less than 5% of normal, while sections of the Sierra Nevada mountains and Nevada have had 400% of normal or more. Arizona has been very dry. So what is been going on to give this strange precipitation pattern? I can tell you, by showing the upper level (500-hPa) weather map for today at 8 PM. A ridge of high pressure is over Washington, but it is undercut by a trough moving into California. This kind of configuration has been occurring on and off for several weeks, bringing clouds and showers (lots of thunderstorms) to northern CA and the western interior. And did I mention lightning? Let me show you an AMAZING image--the lightning strikes over the Northwest for the 24 h ending 1 AM Thursday. Mama Mia..that is a lot of lightning.... and notice how it totally avoids the lowlands of western WA and Oregon. So if you want to get wet, head to California and Nevada. Like dry conditions? Western Washington is the place to be. There is so much interesting structure to the lower atmosphere that we never see. Eddies and swirls. Deflection around buildings. Large wind speed changes in the lowest few feet above the surface. Generally invisible, with perhaps a hint evident in the fall when the leaves are fluttering around. But today everything was revealed. Every detail. Every nuance of the turbulent airflows near the surface. 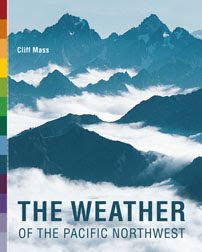 The cause of this meteorological boon? 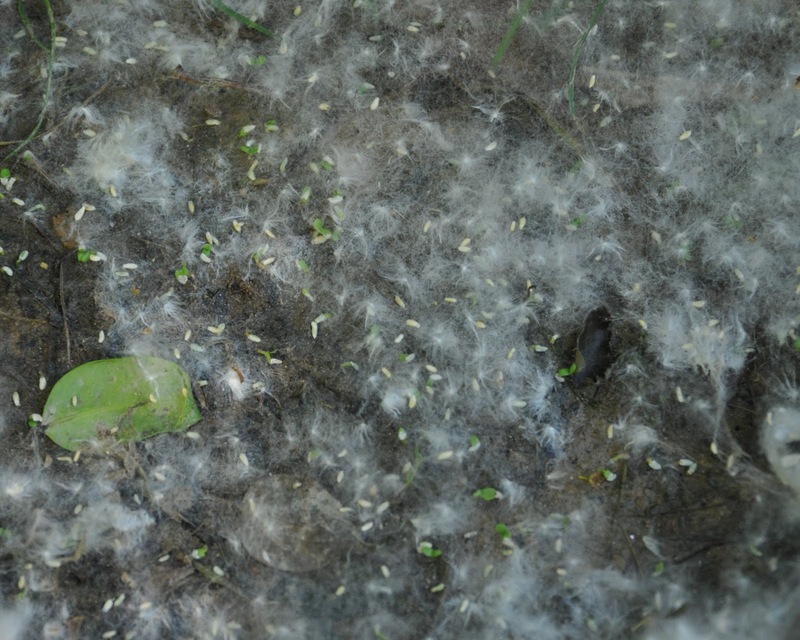 The annual seed dispersal of the region's cottonwood trees. 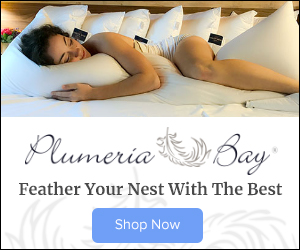 Every May and early June, during a period when temperatures warm, the seed pods of cottonwood trees burst open, with each seed tied to a good-sized tuft of cotton-like material. The sky fills with millions of puffs of cotton, each pushed about by the airflow before they eventually reach the ground. Here are a few videos I took today in my neighborhood today. 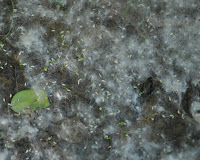 I was fascinated by the motions revealed by the tuft of "cotton." Turbulent eddies of all sizes were evident, as was the weakening of the winds near the surface. Slowly the lawns and gardens turned white. In a number of ways, the U.S. National Weather Service (NWS) needs to reform its practices. And let's be very clear, I don't mean that NWS forecasts are getting less skillful. They are getting better. But it is clear that the NWS has fallen behind the state-of-the-art and is not producing as skillful or useful products as it could or should. 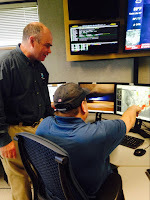 This blog will consider the role of human forecasters in the NWS and how the current approach to prediction is a throwback to past era. As a result forecasters don't have time to take on important tasks that could greatly enhance the quality of the forecasts and how society uses them. 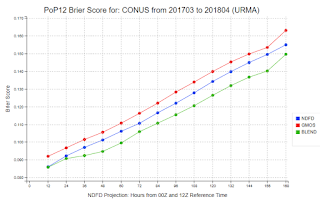 Let me begin by by showing you a comparison of forecast accuracy of the NWS versus major online weather sites, such as weather.com, weatherunderground.com, accuweather.com, and others. This information is from the web site https://www.forecastadvisor.com/, which rates the 1-3 day accuracy of temperature and precipitation forecasts at cities around the nation. I have confirmed many of these results here in Seattle, so I believe they are reliable. I picked three locations (Denver, Seattle, and Washington DC) to get some geographic diversity. Note that the NWS Digital Forecast is the product of NWS human forecasters. The National Weather Service forecasters are not in the top four at any location for either the last month or year, and forecast groups such as The Weather Channel, Meteogroup, Accuweather, Foreca, and the Weatherunderground are in the lead. And these groups have essentially taken the human out of the loop for nearly all forecasts. 12-h precipitation? The objective blend is better (lower is better on this graph). 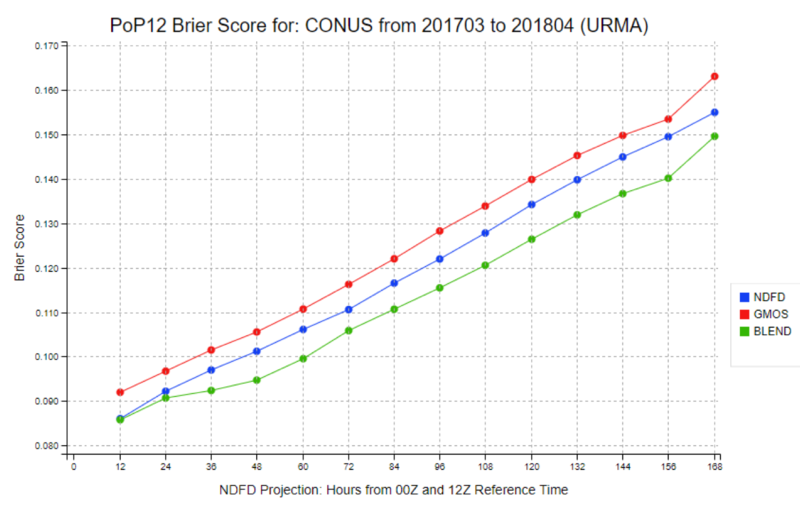 I could show you a hundred more graphs like this, but the bottom line is clear: human forecasters, on average, can not beat the best objective systems that take forecast model output and then statistically improve the model predictions. graphical rendition of the weather for their areas of responsibility. Specifically, they use an interactive forecast preparation system (IFPS) to construct a 7-day graphical representation of the weather that will be distributed on grids of 5-km grid spacing or better. 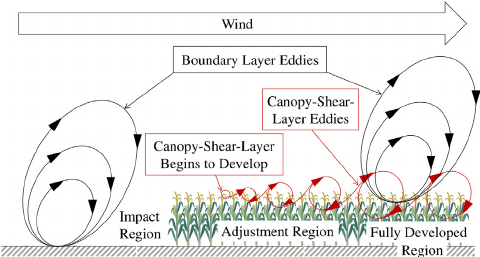 To create these fields, a forecaster starts with model grids at coarser resolution, uses “model interpretation” and “smart” tools to combine and downscale model output to a high-resolution IFPS grid, and then makes subjective alterations using a graphical forecast editor. Such gridded fields are then collected into a national digital forecast database (NDFD) that is available for distribution and use. The gridded forecasts are finally converted to a variety of text products using automatic text formatters. So when you read a text NWS forecast ("rain today with a chance of showers tomorrow"), that text was written by a computer program, not a human, using the graphic rendition of the forecast produced by the forecasters. But there is a problem with IFPS. Forecasters spend a large amount of time editing the grids on their editors and generally their work doesn't produce a superior product. Twenty years ago, this all made more sense, when the models were relatively low resolution, were not as good, and human forecasters could put in local details. 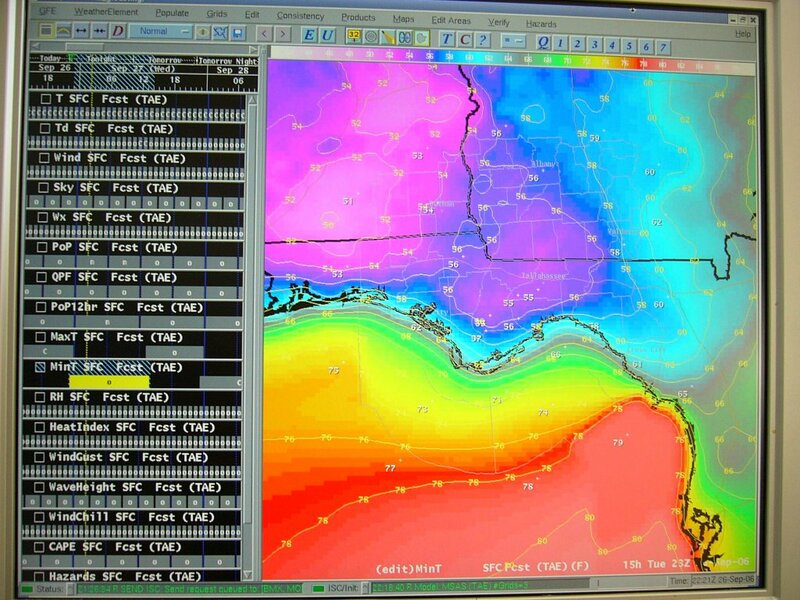 Now the models have all the details and can forecast them fairly skillfully. And this editing system is inherently deterministic, meaning it is based on perfecting a single forecast. 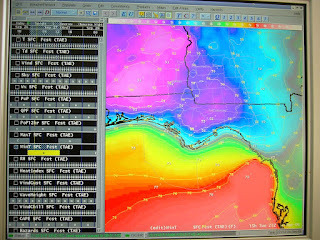 But the future of forecasting is inherently probabilistic, based on many model forecasts (called an ensemble forecast). There is no way NWS forecasters can edit all of them. I wrote a peer-reviewed article in 2003 outlining the potential problems of the graphical editing approach...unfortunately, many of these deficiencies have come to light. 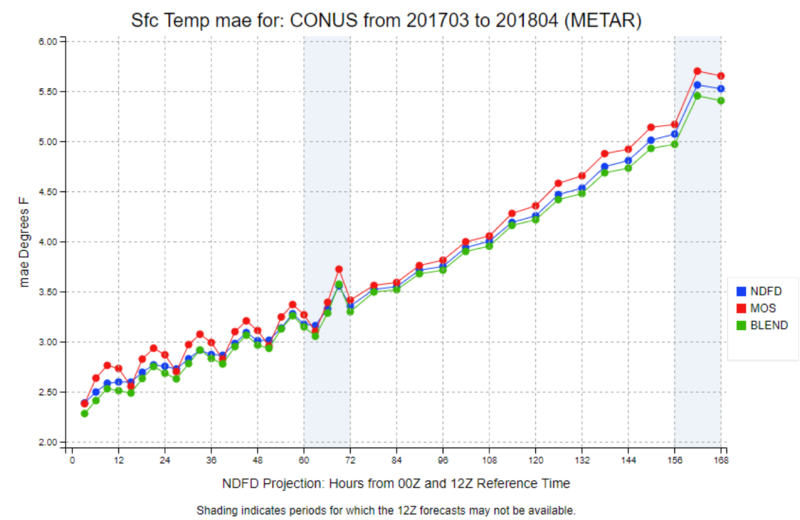 Spending a lot of time on grid editing leaves far less forecaster time for more productive tasks, such as interacting with forecast users, improving very short-term forecasting (called nowcasting), highlighting problematic observations, and much more. But what about the private sector? Private sector firms like Accuweather, Foreca, and the Weather Channel all use post-processing systems that descended from the DICast system developed at the Research Application Lab (RAL) of the National Center for Atmospheric Research (NCAR). DICast (see schematic below) takes MANY different forecast models and an array of observations and combines them in an optimal way to produce the best forecast. Based on based performance, model biases are reduced and the best models given heavier weights. This kind of system allows the private sector firms to use any input for their forecasting systems, including the gold-standard European Center model and their own high-resolution prediction systems, and is more sophisticated than the MOS system still used by the National Weather Service (although they are working on the National Blend). The private sector firms do have some human forecasters, who oversee the objective systems and make adjustments when necessary. The Weather Channel folks call this "Human over the Loop". The private is using essentially the same weather forecasting models as the NWS, but they are providing more skillful forecasts on average. Why? Better post-processing like DICast. DiCast and its descendants might be termed "machine learning" or AI, but they are relatively primitive compared to some of the machine learning architectures currently available. When these more sophisticated approaches are applied, taking advantage of the increased quality and quantity of observations and better forecast models, the ability of humans to contribute directly to the forecast process will be over. Perhaps ten years from now. So What Should the National Weather Service Do? First, the NWS needs to catch up with private sector in the area of post-processing of model output. For too long the NWS has relied on the 1960s technology of MOS, and the new National Blend of Models (NBM) still requires work. 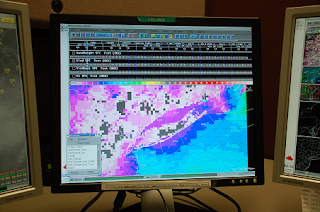 More advanced machine learning approaches are on the horizon, but the NWS needs to put the resources into developing a state-of-the-art post-processing capability. Second, the current NWS paradigm of having a human be a core element of every forecast by laboriously editing forecast grids needs to change. 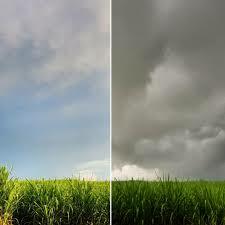 The IFPS system should be retired and a new concept of the role of forecasters is required. 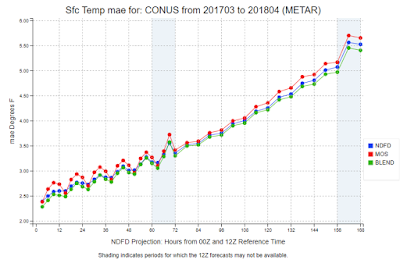 One in which models and sophisticated post-processing take over most of the daily forecasting tasks, with human forecasters supervising the forecasts and altering them when necessary. 1. Forecasters will spend much more time nowcasting, providing a new generation of products/warnings about what is happening now and in the near future. 2. 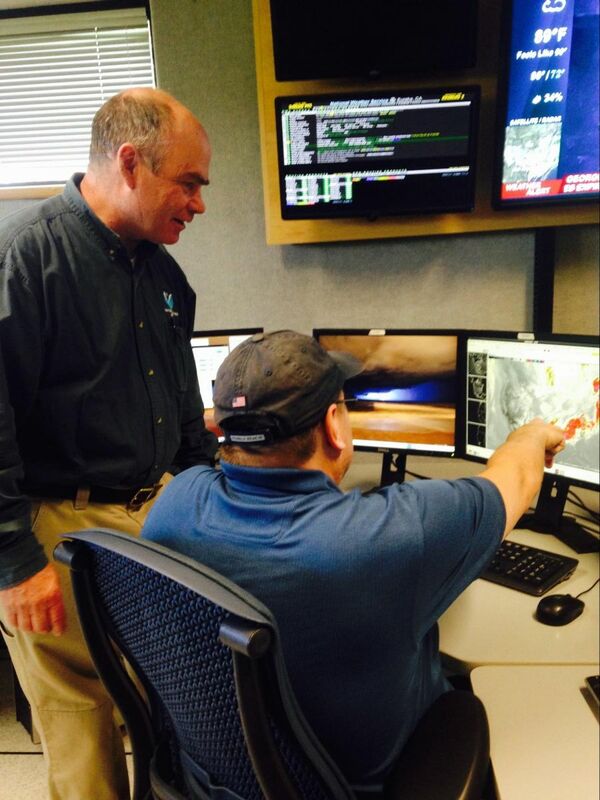 With forecasts getting more complex, detailed, and probabilistic, NWS forecasters will work with local agencies and groups to understand and use the new, more detailed guidance. 3. Forecasters will become partners with model and machine learning developers, pointing our problems with the automated systems and working to address them. 4. Forecasters will intervene and alter forecasts during the rare occasions when objective systems are failing. 5. Forecasters will have time to do local research, something they were able to do before the "grid revolution" took hold. 6. Importantly, forecasters will have more time for dealing with extreme and impactful weather situations, enhancing the objective guidance when possible and working with communities to deal with the impacts. 44 people died in Wine Country in October 2017 from a highly predictably weather event. I believe better communication can prevent this. I know there are fears that the NWS union will push back on any change, but I hope they will see modernization of their role as being beneficial, allowing the work of forecasters to be much more satisfying and productive. If you like dramatic contrasts, Washington State offers a world-class example--and I am not talking about politics. Over eastern Washington a number of rivers are at flood stage, some reaching record levels. Thunderstorms and heavy rain have been pummeling the Columbia Basin and northeast WA. The National Weather Service has issued a flood warning for several counties including Okanogan, Bonner, Chelan, Ferry and Pend Oreille, and the Kettle River, which flows through Ferry and Stevens counties, had a record high on May 10 of 22.54 feet on May 10, busting the previous record of 21.1 feet in 1948. 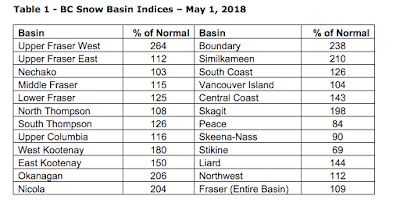 In contrast, over the west, many locations have had little precipitation in May, and there is chance Seattle will have its driest May on record. Not black and white. But dry and very wet. But why? And is spring flooding in eastern WA unusual? Let's start by checking out the flooding situation, with information from the NOAA/NWS River Forecast Center in Portland (below). Red dots are floods, blue dots indicated moderate floods, and purple are major floods. And several other locations are at bank-full. What is going on? The combination of a healthy mountain snowpack and warming temperatures, resulting in rapid melting of snow, and the filling of regional rivers. 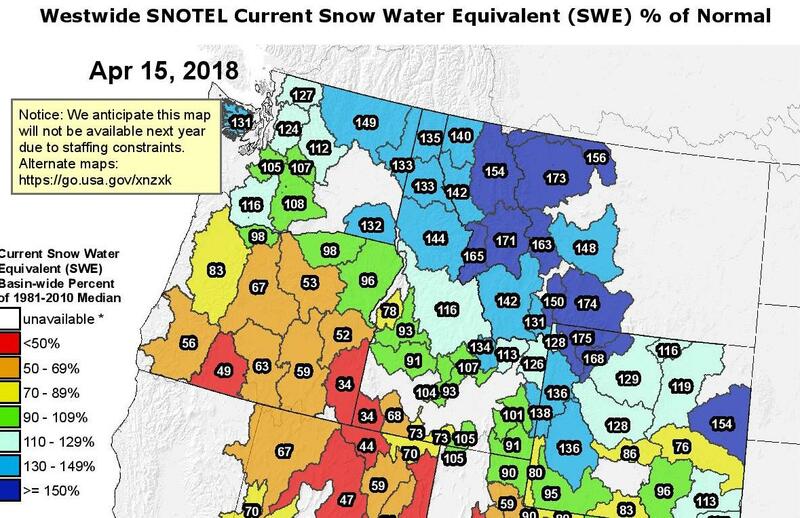 Here is the snowpack numbers for April 15th, from the very nice SNOTEL web site. Washington, northern Idaho, and Montana had snow-water amounts well about normal...in some locations above 150% of what is typical. So going into spring with a bountiful spring snowpack was step 1. Then a combination of warming temperatures and increasing spring solar radiation caused rapid snowmelt. The departure of average temperatures from normal (below) shows our temperature anomaly (difference from normal) for the past two weeks, with much of eastern WA and northern Idaho being 6-8F above normal for that period. So the normal rapid snowmelt of spring was supercharged by warmer than normal temperatures. But like a late-night commercial, I should note that there's more. The weather pattern has produced wetter than normal conditions east of the Cascade crest (and drier than normal to the west)--see map below of the precipitation departure from normal for 5/3-5/16. During the past few days, showers and thundershowers have moistened eastern Washington (see radar image for 3 PM yesterday), with the last 24-h totals being impressive. A number of locations in northeast WA have gotten over 1 inch during the last day. So why wet east of the Cascades and dry west? Because there has been a persistent ridge of high pressure along the coast, with troughs (low pressure) moving into California and northward into eastern WA and Idaho (see upper level--500 hPa--map for 5 PM Thursday to illustrate.) The ridge has kept western WA dry, while the transient troughs have initiated thunderstorms east of the Cascade crest. It is important to note that spring-time flooding in eastern Washington and along the Columbia is the normal state of affairs in our region. Before the Columbia and Snake River dams were in place, major and often catastrophic flooding was commonplace. 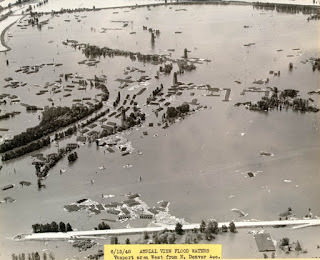 One of the most famous events was the great snowmelt flood of May 1948. 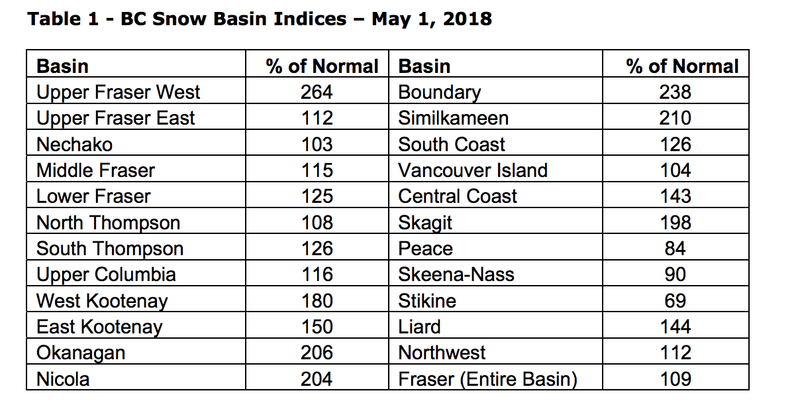 Just as in this year, regional mountain snowpack was above normal, unusually warm temperatures hit during mid-month, and thunderstorms dampened eastern Washington. 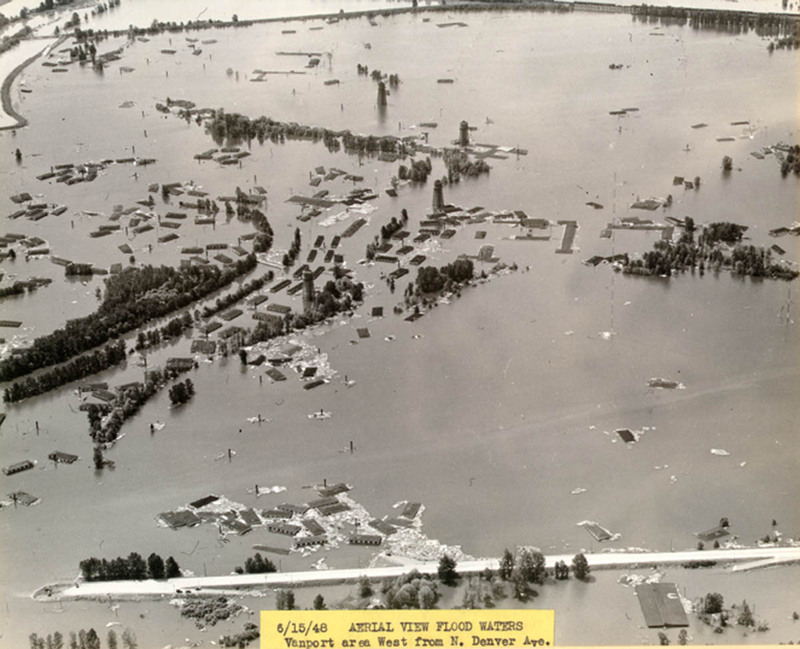 Richland flooded and the surge of water moved down the Columbia, inundating and destroying the city of Vanport (near Portland), which was never rebuilt. As global warming reduces the regional snowpack later during this century, the threats of such springtime flooding should gradually decline over time. Will Hawaii's Vog Head Our Way?